In a vlog a little while back, I suggested doing shelf tours for those of you who might be interested in a more detailed look at what I've got on my bookshelves, and lots of you seemed keen. I figured it would actually be a lot easier for me to do this on the blog than on video, so I thought I'd start with the classics. I rarely talk about books that weren't written in the last fifty years on my channel or on here, so I thought this might make for an interesting start. Plus I have a very loose kind of categorisation going on on my shelves so I thought this would be a fairly easy one to begin with. I do have other classic novels, too, but the ones listed here are obviously just the Penguins. Please bear in mind that I read most of these books years ago, so any reviews I might have to give will be probably vague and/or brief. When you're always stuffing new books into your head it's all too easy to forget the old, but I hope that it still satisfies any curiosity surrounding this very neat looking shelf. I have no idea why I own these books, nor did I know some of them even existed before taking these pictures, but I suspect I bought them for some course in Edinburgh (probably in the first two years) and then proceeded not to read a single one. Or maybe I picked one or two up in a bookshop on a whim. Has anyone read them? Are they any good? I'll get round to them one day. I believe I may have written an essay on this collection of short stories back in my third year of Edinburgh, and I certainly remember them fondly. This is one of the first books that was somewhere between a novel and a collection of stories, as each one takes place in the same town and features some overlapping characters (I think), but follow different plots. They are quiet stories about a place called (you guessed it) Winesburg in Ohio, featuring characters that are perpetually isolated or cannot communicate properly. Anderson kind of feels like a precursor to an author like Carson McCullers, so if you enjoy her work you'll like these. Don't expect any real structure, but rather more character exploration. A true classic, this one. Hardy's prose is very thick and almost treacly with despair, which is a style you're either going to get on with or not. I'm not overly enamoured with it in the grand scheme of things, especially coupled with the particularly tragic plot lines of his books, but I can appreciate them as works of art and as canonical Victorian literature. This novel follows the life of Jude Fawley, who has great aspirations but is continually beset by tragedies, particularly in his relationships. Be prepared to be worn out by this book. I studied The Blazing World for one of my early modern classes at uni, and it is described as a 'proto-science fiction'. It describes a parallel universe with all of its flora and fauna, and it's a pretty crazy piece of work considering it was written in 1666. Worth reading if you like that kind of period, and also you want to read a woman! There's not going to be many of them on this list. This is one of those books that I know to be important, possibly because of its genre experimentations, but as you can see I haven't got round to reading it just yet. I don't remember much about this book apart from the fact that I enjoyed it. If I'm going to read an older novel, I generally like the books that would have been considered 'pop fiction' at the time they were written, and this is one of those. It's a mystery novel, and also part of the sensation fiction movement, which basically means it's a bit melodramatic. When I googled this book again and tried to read up on the plot, I got lost very quickly; it's twisty and turny and a good read. From what I can remember, I think I liked this book a little more than Hardy's Jude. But that doesn't mean it's any less upsetting or tragic. This time it follows Tess, an impoverished girl from Hardy's fictional county of Wessex, and the trouble that she finds herself in despite being 'a pure woman'. It's pretty harrowing stuff. When I looked at that bent back spine in this picture I just thought… when did I read this? I had no idea I had read this… Having familiarised myself with the plot again I do now vaguely remember it but it can't have made a huge impression on me at the time. I think it's a romance novel from what I can tell, and those do tend to grip me a bit less, so perhaps that's why. You may be wondering why on earth I have so many Hardy novels when I don't even like his writing style that much, but he is my mum's favourite author (especially from her teenage years) so call it a labour of love. This is one of Hardy's earlier novels and therefore is actually a bit cheerier, and follows a group of musicians in a small village rather than one titular character. Donne will always have a special place in my heart because I studied him extensively for A Level and wrote countless timed essays on his poetry, learning much of it off by heart. I think for one of my undergraduate exams I ended up re-learning one or two of his poems for a task we had to do. I enjoy both his more bawdy poetry and his religious sonnets, and I remember really enjoying studying him, even though it's not something I would choose now. I read this book so long ago that I actually hadn't started my 'thing' of bending the spine back every 100 pages. I remember physically reading it in the house we lived in at the time, so I think I was probably somewhere between ten and twelve. I remember there were dogs in it, and that I quite enjoyed it despite it being a little more challenging for a young reader. Truly that's all I can offer you about this one. This is the only Austen on this shelf, but only because I think the other copies I have of her novels are not Penguin editions. I wrote a project on this book once comparing it with its 90s incarnation in the form of Clueless, so I spent a lot of time with it when I was seventeen. I enjoy Austen, particularly her more humorous moments, but as I said me and romance don’t tend to get on so well, and I find her too prim for me sometimes. If you guys don't already know about this one - though I'm sure you do - it focuses on Emma, who thinks herself worldly wise and a top notch matchmaker, particularly with regards to her younger friend Harriet, but she only ends up getting them both into a pickle romantically. The Dickens-fest begins. 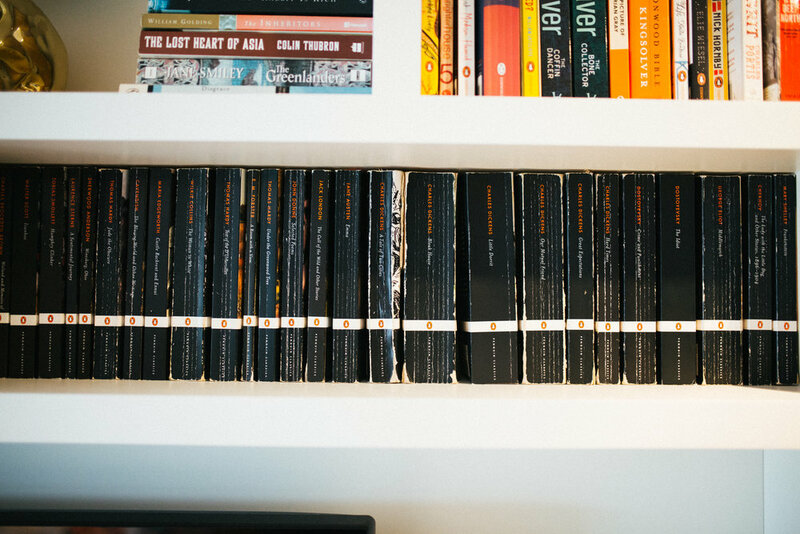 You're about to be hit by an onslaught of Dickens novels, whether you like it or not. In hindsight I don't know quite why I made my way through such a substantial amount of Dickens' bibliography, but I think it was at least partly inspired by my love for Our Mutual Friend which I did at A Level (more on that below). This novel is by far his best though; it is set in London and Paris, it's about the French revolution, it has a crazy winding plot, and it's also one of his later novels, which take on a bit of a darker turn in general. Also the ending made me cry! I took this one on holiday hence why its spine is bloated (always love a bit of light holiday reading). Yes, I made my way through the entirety of Bleak House. It was a bit of a slog, this one. It's about an extremely drawn out legal case and lays out the law's dark underworld, but it wasn't my favourite of his books. As we can see I got just over 100 pages into this book before I got distracted by something else. I'll come back to it someday, I hope. Another of my favourites alongside A Tale of Two Cities. As I said, I studied this one for A Level and just fell in love with it (when you've been reading the likes of Austen for your slice of Victorian life, Dickens can seem pretty spicy). It's another late novel, which perhaps explains its accomplished tone and writing style. It starts with a mystery, and winds its way through a huge ensemble cast of characters in Victorian London. If you're going to read one of his big ones, go with this one. I looked at the spine of this and thought… did I not read this? I think what must have happened was I read it on my Kindle for some reason and already owned the book copy too, because I certainly remember reading it. It is one of the key early coming-of-age novels in English literature, and is told from the point of view of orphan Pip. It's one of his most famous, and has imagery in it that you would almost certainly recognise from some cultural point of view, so it's worth reading if you like this period. I like this one a bit less. Although socioeconomic problems are woven into all Dickens novels, this one wears it even more on its sleeve (which basically means it must be blaring it in every sentence). It's set in an industrial city in the north of England and because its style almost seems to mimic that of machinery, it can be harder to get into. If you're looking for a cultural artifact about the industrial revolution though, you can't get much better than this. I think this book ended up taking me about a year to read on and off in amongst school and everything else. It's a Russian classic, and it follows the complex moral dilemmas facing a destitute ex-student before and after he decides to murder a nearby pawnbroker for some money. We see him being investigated and under some serious psychological pressure. I'm glad I read it, but it was tough. Plus I'm sure it was better in the original language. I have a love/hate relationship with this book. I studied it for A Level also and did enjoy it eventually (as often happens when I'm studying something extensively), though I found it to be a bit too self-righteous and didactic for my liking. I know Dickens is self-righteous and didactic but at least it's got an exciting plot. The subtitle of this book is 'A Study of Provincial Life' which I think sums it up quite nicely; it follows the residents of a town called Middlemarch, and like Our Mutual Friend has a big cast of characters that overlap and interact. All in all, it's a little bit dull but also kind of important and/or good? Also, it's written by another woman and we need to take all the women we can get. I don't remember much about these stories except I didn't get on massively well with Chekhov's style of writing. Our final novel, and another one written by a woman, this one perennially outshone by her famous husband. She wrote this extremely experimental and accomplished novel at the tender age of eighteen. It fuses Gothic and Romantic styles and it's also kind of a sci-fi? It's not my favourite book ever to read, but I'm kinda rooting for Shelley all the way for it, because it's pretty crazy that it was published in 1818. We all know what this one is about, but one of the parts of the book that stands out for me is when the monster describes learning language for the first time; it's quite incredible, and it's the kind of thing easily missed in the barrage of cultural references to Frankenstein. So that concludes our first shelf tour! I really hope you guys enjoyed it, let me know if you'd like to see more. Also what are your favourite 'classics'? Let me know.